I love the cheesy, fried yumminess of chips and queso or a chile relleno as much as the next person. But sometimes it’s nice to have a healthy Mexican recipe on hand to balance out all the heaviness of carbs and dairy. 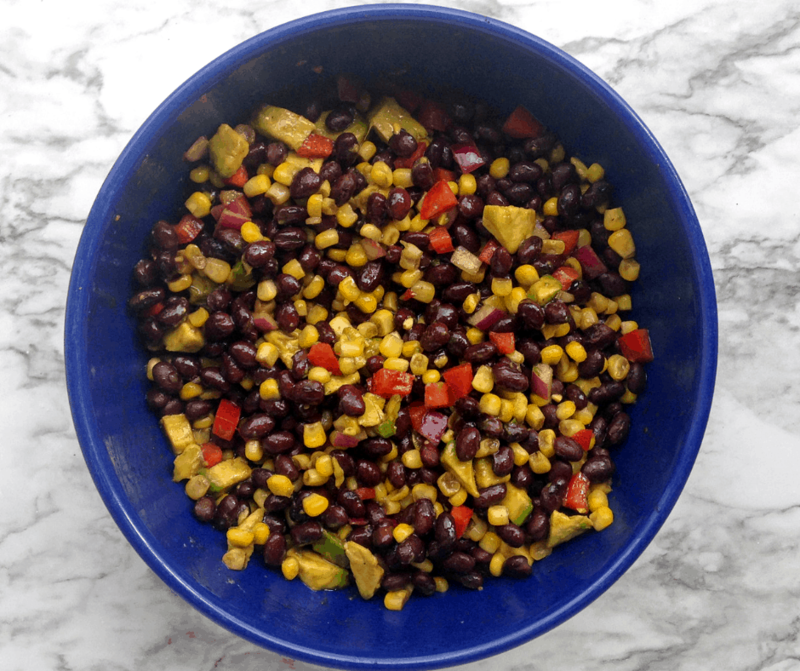 Enter this easy Black Bean and Corn Salad with Balsamic Vinegar. With a simple combo of black beans, veggies, and a balsamic vinaigrette, this Black Bean and Corn Salad is easy to throw together. If you can open cans and dice some veggies, you’re good to go! That’s my kind of recipe. Want to learn how to make it? 1. Combine drained black beans, corn, onion, avocado, pepper, and cilantro in a large bowl. 2. In a small bowl, mix together balsamic vinegar, oil, honey, and salt and pepper until well-combined. 3. Pour the vinaigrette over the black beans and veggies. Stir to combine. 4. Let sit in the fridge for at least 30 minutes for the flavors to combine. Stir before serving. Make this a main dish by adding grilled chicken. This recipe is very forgivable — you can change it easily to fit your needs. Use either canned or frozen corn. Omit the avocado or cilantro if you don’t like it. Use any color of bell pepper that you have on hand. Make it your own! All you need to make this salad are a couple of bowls and a whisk for the vinaigrette. Here is a blue bowl similar to mine, and I also love this simple white one since the salad is so colorful. 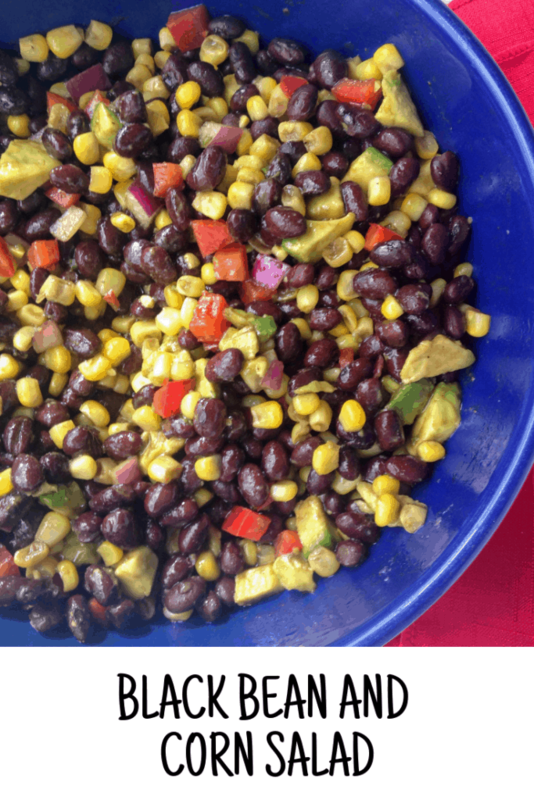 Is Black Bean and Corn Salad Healthy? Yes! If you’re trying to eat low-carb, it might not be a great option because both beans and corn have carbs. But otherwise, it’s a “clean” side that tastes both fresh and delicious! This salad is a great side with Mexican meals or with grilled pork or chicken. I also often serve it as a topping in a Build-Your-Own Mexican Bar. There it acts as a black bean and corn salsa — it’s a great dip with chips (similar to Cowboy Caviar). No matter how you serve it, this Black Bean and Corn Salad with Balsamic Vinegar is healthy and delicious. Have you made it? I’d love to hear how you like it! Leave a comment below or tag me on Facebook. If you like this recipe, you’ll LOVE these 15 Mexican party food ideas! Check them out! Black beans, corn, and veggies combine with a balsamic vinaigrette to make a fresh and delicious salad. Combine beans, corn, onion, avocado, bell pepper, cilantro, and garlic in a large bowl. In a small bowl, whisk the vinaigrette ingredients until well-combined. Pour over the black bean and corn mixture. Place in the fridge for at least 30 minutes to allow flavors to meld. Stir well before serving. I want this with chips…NOW!! Thanks for the recipe, Sandi!